Homage to the cookbook from the Haven restaurant with its fantastic recipes from the Khmer cuisine and a little story about how I came to this book. 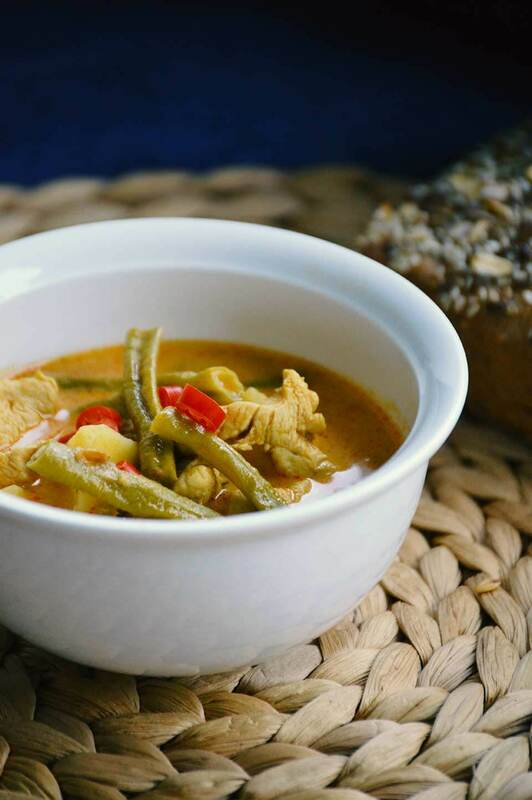 Also, you’ll find the delicious Khmer Chicken Curry recipe from the Haven cookbook at the end of this article, to cook and enjoy at home. To me, the Cambodian cuisine is like heaven on earth. Flavorful, well-rounded and never too spicy. The Khmer are simply gifted at conjuring up delicious dishes on the plates. It’s a pity that there are not more Cambodian restaurants in this part of the world. For a Cambodia lover like me, the Thai or Vietnamese around the corner is in its own way very good, but it’s just not the same. So there’s only one thing that can be done: cook it yourself and bring the flavor fireworks of the Cambodian cuisine to the domestic stove! Due to the lack of experience in the preparation of Cambodian food, a suitable recipe is required. Preferably with a “built-in” guarantee to make sure the result doesn’t end up in the garbage bin. With Haven – Cooking for a cause from the Haven restaurant in Siem Reap, I own the most wonderful Khmer cookbook imaginable. In August 2016 I meet Sara, one of the operators at Haven restaurant. The Haven is a very special place with very special people and very special dishes. (When you are in Siem Reap, you just have to eat there!) During our brief and very warm meeting, Sara tells me that Haven will be bringing out a cookbook soon. I was immediately full of enthusiasm. I MUST have this cookbook. Seriously! But it turns out to be not that easy. Because the printing process was taking longer than planned and our journey home was moving closer. An hour before we leave Siem Reap to return home, Sara and her husband Paul finally get their hands on the freshly printed cookbooks. We quickly arrange a meeting point and a short time later Sara -beaming with joy- hands me the new cookbook. I feel so honored to be the first to see it. After all, we had only met once. Of course I bought a copy. And I am proud of the fact that I am the very first owner of the Haven cookbook. The recipes in the book are all to die for. And what makes it even better is, that you can find all the ingredients in any well-stocked Asian store. Whether you’re looking for Thai eggplant, long beans, tamarind paste, morning glory, (just to name a few) – you can buy everything here. Get started with the basics where you can make your own curry paste instead of buying the ready-made one at the Asia store. The starters, salads, soups and Cambodian main courses follow this. With the Khmer Curry, Fish Amok and Beef Lok Lak all national dishes are included. Whereby the recipes in the Haven cookbook stand out with their own individual touch. Like the celery in the Lok Lak – which I have never experienced anywhere else. Desserts and a list of special ingredients and spices complete the cookbook. The recipes are perfectly explained. What’s really convenient is that the ingredients are listed in the order as they are used. I will go so far and claim that anyone can cook the individual Khmer dishes with the Haven cookbook. Even a beginner. However, the cookbook is in English. So you do need to have some English knowledge. What’s more, every recipe is accompanied by an enticing photo. I can already smell and taste the fragrant ingredients of the dishes just by looking at the pictures. The Khmer Chicken Curry from page 58/59 tastes fantastic! Especially the sauce is simply divine! From the curry paste, tamarind paste, garlic, shallots, fish sauce, coconut milk, cinnamon, sugar and salt, you can conjure up a sauce that is second to none. My taste buds would bounce around with joy if they could. Every single spoon creates pure pleasure! Here is my Khmer Chicken Curry. Looks great, doesn’t it? I will not give away any more details – after all, I want to encourage you to buy this book and therefore make a contribution to the education of young Cambodians ;-) I will however soon share another Khmer Curry recipe with you here, which I cooked together with Cambodians. But this might take some time – a few weeks, if not more. Want read more about Haven? Find out in my interview with Sara from Haven restaurant. Send me a photo of your Cambodian dish, maybe even from the Haven cookbook. I will post the photo here in the article. Email it to inga@visit-angkor.org. Have fun cooking and enjoy your meal. A really great cookbook with delicious Khmer recipes easily explained. It's the perfect companion to cook Cambodian cuisine at home. Next ArticleHow you can change the life of children in Siem Reap with just a handout?